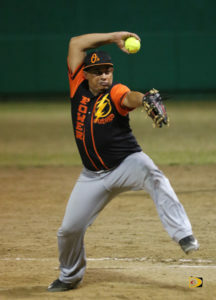 Power Outage opened the Virgin Islands Baseball Association Harriette Skelton Softball League Championships on Sunday, with a 10-3 victory over the A’s. The A’s were coming off a sweeping the Pirates, following Friday night’s 9-2 triumph. Yervis Rodriguez fired a three hitter for the victory. Jayque Hopkins, took the loss. Power Outage had 10 runs, 8 hits, 2 errors and left 5 runners on base A’s had 3 runs, 6 hits, 1 error and stranded 8. Junior Rodriguez of Power Outage went tripled in three at bats, scored a run and had 2 RBI’s. Jamal “Lefty” Allen went 2-for-2 with 3 runs scored and a run batted. Jeremy Penn also went 2-for-2 with 2 runs batted in. The Women’s Championships pairings have been set, following Sunday’s games. The Hawks beat the Lady Pirates 14-6, to win their playoff series 2-1. St. Thomas’ Tradesha Hart was the winning pitcher while Perline Scatliffe-Leonard suffred the setback. The Hawks’ 14 runs came off 11 hits. They made 2 errors and left 3 runners on base. Lady Pirates had 6 runs, 7 hits, 4 errors and stranded. Shanika Forbes of Hawks, had a 2-for-2 with 3 runs scored and a run batted in. Deja Adams had a hit in two at bats with 2 runs batted in while veteran Gertrude Thomas, was 2-for-3 with 2 runs scored and 3 RBI’s. Khiayah Doward was the Lady Pirates’ top hitter and went 2-for-2 with a triple, a run scored and 2 runs batted in. The Hawks advanced to face That’s Ya Problem, who swept Walk Off, with an 11-1 victory. That’s Ya Problem’s Sheniqua Fahie, fired a one hitter for the victory. Darier Malone took the loss. Fahie helped her cause by going 2-for-2 with a run scored and 3 RBI’s.